The power of thought is unparalleled. Even the simplest thoughts have the tendency to shape your reality. You could say that your thoughts form the foundation of your reality; once you think of an idea, you can then take the necessary steps to make it happen in real life. While anyone can dream up an idea, not everyone is able to turn that idea into a reality. Take INN8, for example. Without a few clever kids pondering about how to change the way investments are done and then actively doing something about it, you wouldn’t be reading this article. Leading the way at INN8 is CEO Mickey Gambale, who entered the financial services industry in the late ‘90s. He has a wealth of knowledge of a wide range of investment businesses, strategies and styles, as well as a deep, practical understanding of the platform industry. The one instinct that has helped him get to where he is today is fear. Instead of letting it work against him, Mickey has made fear an ally. “Fear can be beaten and help you push the boundaries. When the feeling of fear arises, rather than have a ‘fight or flight’ response, I embrace it as an advantageous adrenaline rush. That’s why I really enjoy fast cars and bikes, they are marvels of engineering, purpose-built and designed to stretch the limits of what we previously thought possible. This conquering of fear coupled with a steadfast thought process has assisted Mickey in ensuring success in the way he operates. 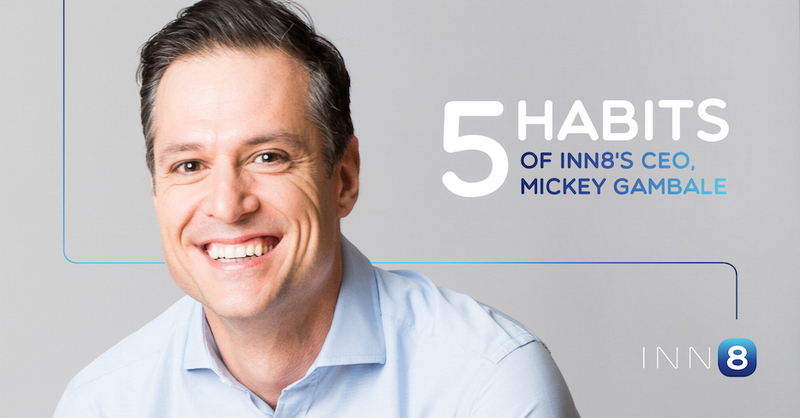 Here are five daily “thought habits” that Mickey has adopted in his day-to-day routine. In his 2008 book Outliers: The Story of Success, Malcolm Gladwell introduced his 10 000 hour principle, which holds that 10 000 hours of “deliberate practice” are needed to become world-class in any field. Mickey is fascinated by the complexity of things that manage to present themselves simply and elegantly; it means someone has already thought through the complicated moving parts and made it look easy. “One of the things that gives me energy in life is when I discover beneath the complex surface a crystal clear, simple concept to explain why things are the way they are. “You might say this is why I love to use analogies. I try to draw from complete opposites to help connect and understand the task or conundrum at hand that needs solving. Somewhere in all that is the answer to the difficult question. Someone may have solved a similar yet different problem that you can draw from to help solve yours,” he explains. To turn an idea into a reality, you first need to own the idea. Next step is to make and implement a plan and then utilise your problem-solving skills to overcome bumps in the road as you go along. The process generally requires a disciplined approach and tireless work to overcome one problem after the next. You can’t just give up before you have even hit the first bump. “I try to live this behaviour in everything I do,” says Mickey. “A positive mind can solve many difficult situations and can help shift you out of whatever is pulling you down. I often self-reflect and ask myself if it’s me getting me down or the situation – you’ll often find its one’s self. It’s safe to say that to become successful, you must first think successfully – a concept Mickey is proving every day.